Collaborating with Retailers in an Omnichannel Marketplace: Challenge or Opportunity? The editors at CGT Magazine recently gathered a handful of experts and thought leaders from the Retail Execution industry to host a candid discussion about collaborating with retailers in today’s omnichannel marketplace. 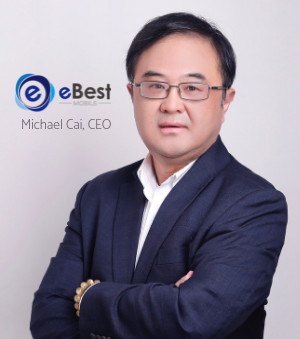 eBest Mobile’s CEO Michael Cai had this to say on the topic. Q: How has the shift to omnichannel retailing affected traditional strategies for effective customer collaboration? Regardless of size, companies can no longer afford to offer a single strategy for customer collaboration. Companies must be flexible, offer multiple options, and tailor strategies to the channel and the customer. Over the last 10 years, technology has been fully embraced and embedded into everyday life – both personally and professionally. So now customers expect their vendors to provide services when and where they need it. When it comes to collaboration, your sales rep in the field is no longer the main point of contact. But, in order to be effective, field reps must have access to better information from more sources. It’s critical for data to be intelligently filtered and shared with field sales reps in a way that is actionable and enables the front line to provide proactive services and solutions. Q: What stresses have these changes placed on existing planning and management tools? I think omnichannel retailing has actually created opportunities for companies who are willing and able to embrace the strategy. Of course, omnichannel retailing comes with its challenges. Building out capabilities and continuously monitoring, revising, and improving customer collaboration methods won’t happen overnight. eBest Mobile is in constant development to meet the changing needs of CPG organizations, but it’s imperative that we stay focused on providing Retail Execution tools that can support today’s needs. To be effective today, seamless connections across internal and external systems is a must. I think omnichannel retailing has actually created opportunities for companies who are willing and able to embrace the strategy. Not only does it make it easier for customers, but it provides an opportunity for manufactures and suppliers to gain insights and react quickly to changing market conditions. Q: What role can Artificial Intelligence (AI) play in improving the manufacturer-retailer relationship? AI, Machine Learning, Internet of Things (IOT) – these can all be used to improve the manufacturer-retailer relationship. These technologies can be used to ensure the retailer has the right products available, at the right place, and the right price for the consumer. They can also be used to increase sales, reduce out-of-stocks, and decrease product returns, which creates a win-win for the manufacturer and retailer. To be effective, AI strategies cannot be one size fits all. For example, fast moving products may require IOT to monitor stock and ensure availability at the shelf. Slower moving products can capitalize on AI to better understand conditions that will improve sales. In some cases, AI can provide accurate predictive orders to not only ensure availability but allow manufacturers and retailers to focus on faster moving or higher margin products. AI is going to be a real game changer for the industry. To read the full article featured in the January 2019 issue of CGT Magazine, click here.